Biography of Late Classical Greek Sculptor. Greek architect and sculptor of the Late Classical Period, Skopas (Scopas) was a successor to Polykleitos (5th century BCE) and a contemporary of Praxiteles (active 375-335) and Lysippos (395-305). A cosmopolitan artist who travelled and worked as far as Asia, Skopas was one of the first representatives of Greek sculpture to introduce powerful emotional expressions in the faces of his marble figures. His most notable freestanding sculptures include the Maenad (Museum Dresden), the Pothoas (Centrale Montemartini, Rome) and Ludovisi Ares (Palazzo Altemps, Rome). Born on the island of Paros, Skopas was taught the art of sculpture by his father Artistander, a noteworthy Greek sculptor of the 4th century BCE. In his early artistic career Skopas work bears similarities to that of Paionios, a sculptor from the 5th century BCE. Paionios tended to produce excitable compositions with lots of action - and this can be seen in parts of the temple of Athena Alea at Tegea (395 BCE) which Skopas decorated with boar hunts and mythical battles of combat. Excavations at the temple have revealed that the 'action' extended to the facial expressions of his figures, which are alive with emotion. Although we know that Skopas worked on several monumental buildings, it is not always clear, even on excavation, as to which parts of the work can be attributed directly to him, rather than to fellow-artists. According to the ancient Greek writer Pliny, Skopas was employed to work on the marble sculpture on the eastern wing of the Mausoleum at Halikarnassos (350 BCE) - while Bryaxis (350312 BCE) was employed to the North, Timotheos to the South and Leochares (c.372-324 BCE) to the West. Over a period of time Skopas appears to have refined his artistic style - absorbing influences from works by Polykleitos (5th century BCE), and others. Although classed as an Athenian, Skopas was really a cosmopolitan artist, working largely in Asia and Peloponnesus. Furthermore, while in general technique and composition he was relatively close to Praxiteles (active 375-335 BCE), he diverged from the younger man in preferring bold expressiveness and vigorous action to repose and sentiment. He assisted on several other monuments such as the Temple of Artemis at Ephesus - he worked on the sculptured columns after its fire in 356 BCE. Many freestanding sculptures are attributed to him, including the Maenad in Dresden and the Pothoas in Rome. Other works, known via Roman copies, include a statue of Meleager (Fogg Museum, Cambridge, Massachusetts), an Apollo Citharoedus (Villa Borghese, Rome) and the celebrated Ludovisi Ares (Palazzo Altemps, Rome). Fragments of relief sculpture, attributed to Skopas, are also housed in the British Museum in London. Skopas is now also believed to be the sculptor of a group of figures representing the destruction of the Daughters of Niobe, formerly attributed to Praxiteles. Copies of the Niobe statues can be seen in the Uffizi, Florence. 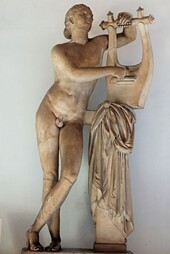 To learn how to appreciate Greek classical sculptors like Skopas, see: How to Appreciate Sculpture. See also our review: Venus de Milo. Antiquarian writers rank Skopas, along with Praxiteles and Lysippos as the three greatest sculptors of the second half of the 4th century BCE. Together, these three contemporaries completely changed the character of Greek sculpture. The schools they founded, the developments they made in art greatly influenced the history of sculpture, thereafter the Italian Renaissance, and through it, modern art.  For more about the history of sculpture from Ancient Greece, see: Homepage.